Charlie Dorton brought the Bulldog Brand to life in 1978. He began importing them from the Olbertz factory in Germany until 1987. The brand went extinct for a few years until Jim Parker bought it in 1991 and resurrected the brand under the Parker Knife Co. umbrella. The first generation knives are the originals from the Olberts factory. They were made there at the same time as Eye Brand and Fight’n Rooster. Many similarities can be seen in knife branded with these three names made in that era. The second generation knives came shortly after Jim Parker bought the brand. He used old parts from the Olberts factory & had them assembled & finished. The third generation to most recent production examples came about when Parker started having his own knives made with a Fighting Dog stamp. that gave way to a standing dog trademark in 1995 & then returned to the Fighting dogs stamp shortly after the year 2000. Great Eastern Cutlery was contracted to make yet another go with the brand most recently. The first table contains links to static pictures & information about the history & more specifically; the various generations of Bulldog Brand knives in existence. The second table has links to interactive Bulldog Brand knife pages on AAPK where you can discuss them, share pictures, & / or buy & sell them. Bulldog Brand Knife Image Gallery This link will bring you to AAPK’s Bulldog Brand specific image gallery. Be sure to upload any pictures you feel might be of interest to others. Bulldog Brand Knife Discussion Board This link will bring you to AAPK’s Bulldog Brand knife Collector specific discussion forum. 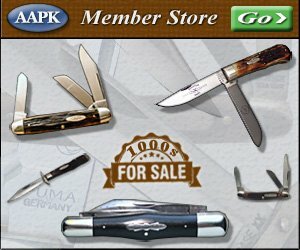 It’s a great place for Bulldog Brand knife collectors to share pictures & information. It’s also a fantastic resource if you seek info about this brand. Bulldog Brand Knives for sale This link will bring you to all of the Bulldog Brand knives AAPK members have available for sale. You will find a very nice selection with new knives added regularly.